Uber accused of leaving blind riders stranded. DENVER -- Every week, Carolyn Haas takes a mandolin lesson with her guide dog, Bennett, by her side. But after this week's lesson, Haas, who is blind since birth, called for an Uber, walked to the curb and waited. "And I heard a car pull up, and then I heard it turn around and take off," said Haas, who said this had happened three times in the last three weeks. "I think he saw the dog. These drivers are treating people who are good American citizens as second class ones or as less than that." 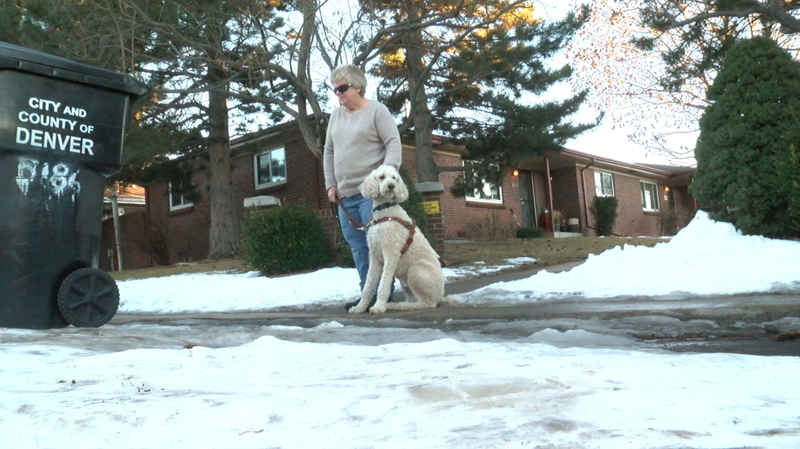 Last week, she heard about Mollie Baland's story on Denver7, another blind woman who said a driver refused to give her a ride because of her service dog. "The driver rolls down the window, and he says 'I can't have a dog in here,'" said Baland. "And then he just drove away." Contact7 is investigating new reports of Uber drivers leaving blind riders stranded because of their service animals, and now we are hearing from some drivers trying to skirt state and federal law. In both women's cases, records show Uber investigated, notified the drivers of their "legal obligations" and wrote that a second report would lead to deactivation. "It seems to be a widespread problem based on reports we get from class members on an ongoing basis," said civil rights attorney Michael Nunez. "The parties anticipated that the issue of service animals would not disappear overnight." Nunez sued Uber in 2014 after reports that drivers were refusing rides to people with service animals. The parties reached a settlement in 2016, which required Uber to establish a service animal policy, notify drivers of the policy and deactivate drivers who knowingly refused riders with service animals. However, reports of issues have continued. "If people are resistant to those kinds of changes, they can sometimes develop or attempt to develop ways around it," said Nunez, who is monitoring the company as part of the settlement and asking riders to contact the National Federation of the Blind with reports of problems. We reached out to Uber drivers to hear their thoughts. One driver, angry about others denying rides, forwarded us comments from a Facebook group. One man (inaccurately) stated: "You can still turn down service animals by simply saying you're allergic to dogs." Another driver posted that he asks riders with services animals to "cancel and request a Lyft." Other riders were tired of "fake service animals." In an email to Denver7, a driver named Sammy said he was concerned about damage, writing "I am a private citizen with my personal car... Take a taxi. I don't have the money or responsibility of a big company."